The item Batman : the rebirth deluxe edition, Issue 934-949, Tom King, Steve Orlando, Scott Snyder, writers ; David Finch, Mikel Janín, Riley Rossmo, Mitch Gerads, Ivan Reis [and six others], artists ; June Chung, Jordie Bellaire [and three others], colorists ; Clayton Cowles, John Workman, Deron Bennett, letterers ; David Finch and Jordie Bellaire, collection cover artists, (electronic resource) represents a specific, individual, material embodiment of a distinct intellectual or artistic creation found in Kent District Library. Someone is targeting Batman's allies in Gotham-young and untested heroes who model themselves after the Dark Knight but don't yet have his training or resources. With the help of Batwoman, the Caped Crusader recruits these young vigilantes, training them to be a team worthy of Gotham's biggest threats. Red Robin, Spoiler, Orphan and Clayface are the first heroes to get recruited. But can a team inspired by Batman and trained by Batwoman take on an entire anti-vigilante army? Or will Batman's vision of a team of Bat-Heroes go down in flames? 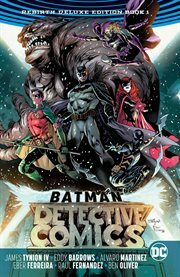 Called "The single strongest book of DC's Rebirth era" by Newsarama, DETECTIVE COMICS features acclaimed writer James Tynion IV (DARK DAYS: THE FORGE) and artists Eddy Barrows (JUSTICE LEAGUE OF AMERICA), Alvaro Martinez (BATMAN AND ROBIN ETERNAL) and more. Collects the first two volumes of the critically acclaimed series!